I had the great honor this week of moderating a forum. Sounds exciting, huh? This one, though, was deep inside one of the most revered places in New England and the nation. A place where as I boy I came to see Jim Rice, Carlton Fisk and Rico Petrocelli. A place where you get goose bumps when you walk in : Fenway Park. It was the Boston Business Breakfast, put on by my alma mater, Xaverian Brothers High School. 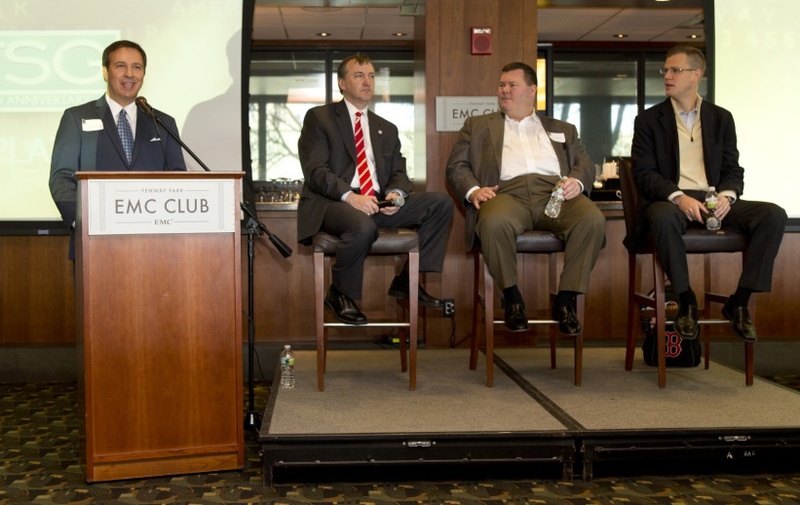 I’m proud to say two fellow XBHS alums are well, kind of important in the Red Sox organization and sat on the panel at the forum: Ed Weiss, the general counsel for the Red Sox, and Mike Egan, one of the team partners. Rounding out the panel was Sox VP and Chief Operating Officer Sam Kennedy. These guys are living the dream: all grew up as Red Sox fans and are now working for their beloved team. The three shared their insight into what it takes to run Fenway Park and one of the most successful sports franchises in the world. Weiss and Egan are also natives of my hometown of Norwood, Massachusetts. Kennedy is a Trinity alum, and loves Hartford. He even worked as an intern for the Whalers, and had an interesting perspective on our state’s chances of seeing a return of the NHL. He’s agreed to come on Face the State next time he is in town. There were about 150 people at the forum who asked questions of the panel, who really have the coolest jobs. Their offices are at the oldest ballpark in America. Anytime Mike, Ed, and Sam want, they can just stroll out and see this. As much as I love my job, at my workplace I look out at a listless suburban office park. Yes, I’m officially jealous. There is history at every turn at Fenway, and it will be very evident this year as Boston’s most popular tourist attraction celebrates its 100th birthday. It was surreal to be at an empty Fenway Park, first thing in the morning with the sun beating down on the Green Monster, and the right field stands where I watched game 1 of the 2004 World Series with my brother. My event was inside the EMC club, above home plate. Inside I got very close to the heavily guarded World Series trophies, but was careful not to touch them. I’ve heard it’s not much fun being escorted by security out of Fenway Park.